I left Detroit for a few weeks to go back to Massachusetts. It’s the third time I’ve been outside of Detroit since moving, and in many ways it was the strangest journey, because I was gone longer than before, and I was returning “home” home to where I grew up. For most of the time I was away I was on Cape Cod, and while I was there in part to see family, I was also attending a week-long workshop at the Fine Art Works Center in Provincetown. The workshop leader also happened to be Matthew Olzmann, who is from Detroit, and has lived in Hamtramck for many years. I spent a few days kicking around Boston. I did a reading in Manchester, NH which was really fun. I attended the House Slam in Roxbury, the first poetry slam series in Boston proper, located at the Haley House in the heart of Dudley, where my biological father grew up. The next day, I took a bus down to the Cape. For many reasons I won’t get into, returning to my hometown always gives me a kind of surreal anxiety. When I left for college, I never came back to live on the Cape again. I sometimes feel like I abandoned my family when I left, but I also did what I felt was right for me. It’s an old story—going “back home”. This trip was particularly strange because I was going back for the first time without the exclusive purpose of seeing my family. I was going to write in the town where my grandfather was born and raised. Cape Cod runs on a tourist economy. I used to work at the Cape Cod Chamber of Commerce when I was in high school, and visitors would ask the strangest questions. They would call because they wanted to know if there were roads, and would be surprised when they were informed that people lived there year-round. It wasn’t until I went to college, though that I really understood the impact of tourism on the idea of what a place is like. Boat shoes, idyllic beaches, and summer homes—that’s what people thought of. I like to say that Cape Cod might have the Kennedys, but that it’s mostly populated by the people who clean their toilets. In the winter, unemployment and alcoholism are rampant. Year-round heroin use is exceptionally high. It’s not pretty, what happens in a tourist town when there’s no one around to marvel at its beauty and clog its streets. When I was a teenager, I hung out on Main Street Hyannis a lot, mostly at the record store or outside of Spiritus Pizza, and if a Duck Boat tour came past, we’d flip off all the quacking out-of-towners, because we were punk and angry and well, teenagers. 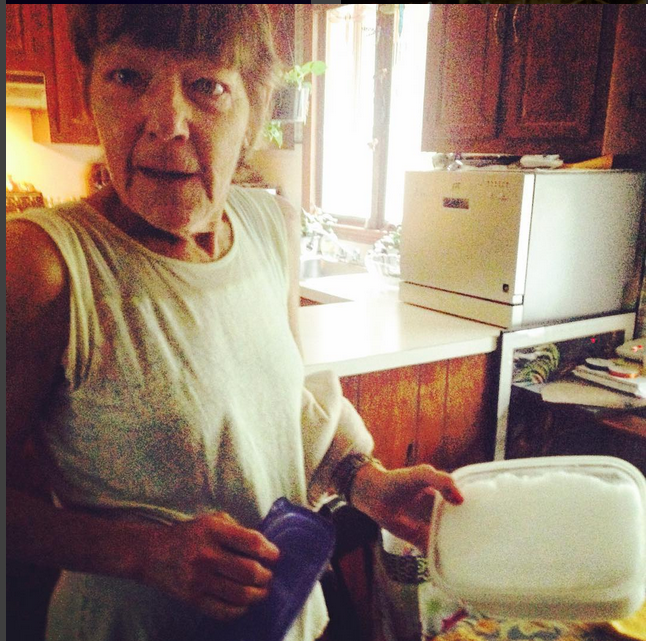 My mom, holding a container of snow she saved from MA's snowpocalyptic winter for her friend who was in Florida. My mom was kind enough to drive me the long stretch from Centerville to Provincetown, and when we arrived, she and I walked around a bit. We bumped in to Matthew at the general store. He had just arrived via Cape Air, a company that operates mostly small low-flying passenger planes out of the Hyannis Airport, where my grandfather used to work as an air traffic controller. I got settled in, and at orientation I met my workshop group for the first time, and then went to the community barbeque. Over the course of the week, I wrote several new poems. One response to a prompt I wrote referenced the Celtics playoff game where Rajon Rondo gruesomely dislocated his elbow. When I finished reading it, Matthew asked if I was a Celtics fan growing up. “Of course!” I exclaimed, before he told me that it was my one personality flaw. During the week, I also made friends with a woman in my workshop who had attended the second ever Cave Canem. She was there with her husband and daughter, who, by the end of the week, we would joke about being my younger sister. It felt anchoring to have them there. On my second day at FAWC, my mom returned to hang out and go to the beach, this time with her friend Pam in tow. Pam also happened to work in the senior’s cafeteria at my high school, and had been friends with my mom for some time, although I hadn’t know that when I was in school. As I got my mom some water from my apartment, Pam asked me how Detroit was. I told her it was great, and that I missed it. She was somewhat stunned. “OK,” she said “you’re in the most beautiful place on Earth, and you just said you miss Detroit. You’re a special kind of person”. Maybe she’s right. I’m not sure how to take “special”, but it wasn’t derisive. I missed being home. When I was at Cave Canem, I had said in workshop that one of the things about having a house was that it becomes part of you, like you and it are the same in some way. My friend said he got chills hearing me say that. It wasn’t just the house I missed, though, it was my neighborhood, the way the sunlight lasts longer, my friends, and the way most people are friendlier. My brother, wearing a shirt from the Quarterdeck, a bar in Hyannis, which is maybe my favorite bar on earth. I had also really missed my mom and brother. I hadn’t seen either of them in about a year and a half. It was nice to go to the beach together. I can’t recall the last time we had done that. The water was rocky, but she had two pairs of aqua shoes in her trunk, like any Cape Cod mom. The next day, my brother and sister in law came up to visit. My niece still didn’t recognize me (she’s 2), and was a bit stand-offish, but we had fun. During the course of my week in P-town, I visited the World War II memorial outside of town hall with my grandfather’s name on it, and the Catholic cemetery where many of my great aunts and uncles are buried. I also visited the house my great-great grandfather built at the turn of the century after immigrating from Cape Verde. He had been a sailor. The house was massive and had a widow’s walk. I found out during my trip that when he retired from sailing, he had been the dock master in Provincetown. I also went to Spiritus Pizza, for nostalgia, and really excellent pizza. the house my great-great grandfather built. My last day on the Cape, my mom and I went and visited my grandmother. I hadn’t seen her in years, because she was always away during the holidays when I was home. She was watching the Red Sox game, like always. She seemed in good health and spirits. The last few years haven’t been easy on her. She had a stroke recently, and her memory wasn’t great, but she was present and jovial and funny. “Tomorrow, I won’t remember seeing you” she said. I’ll remember. I had missed her. Grandma June often looked after my brother and I when we were young. She gave me my first cassette—Sgt. Pepper’s Lonely Hearts Club Band when I was young enough to have no context for who the Beatles were. She is also an avid reader, which made an impression on me from a young age. She would often take us to the library in Hyannis, “the big library” we called it. After we left, my mom and I considered stopping at the beach, but ended up going to Four Seas Ice Cream instead. I am lactose intolerant, but I would do terrible things to get this ice cream, it’s that good. My mom and I sat on benches behind the shop, and she told me about a drug bust that had almost happened at the motel across the street, where she used to work. In that moment, everything was familiar—my mom’s accent, the church behind us, the library up the hill—it was peaceful. The house I spent my adolescence in never quite feels that way. It’s my mom’s home now, and even though my dad died thirteen years ago, I still want to wait for him to come home from work. I didn’t stay the night. I knew it really upset my mom, and I hate doing that. I had been waking up every night that week in terror—dreams where I watched Dad carried out from the house by medics again, dreams where I was screaming at my mom. I was protecting myself and being a bad daughter all at once. I hated the feeling of leaving because I don’t get to see my family nearly enough, and I was making my mom cry. When I boarded the plane back to Detroit, I had to make peace with it. I wasn’t leaving home, I was returning to it.